The Little Brown bat is one of the most common bats in North America, and has been a model organism for bat studies and research. As the bat’s name suggests, it’s fur is uniformly dark brown and glossy on the back. The upper body is slightly paler, with greyish fur underneath. This species of bat has 38 teeth, all of which are relatively sharp. As is typical for insectivores, the Little Brown bat’s canines are very prominent, to enable grasping of hard-bodied insects; while still in flight. 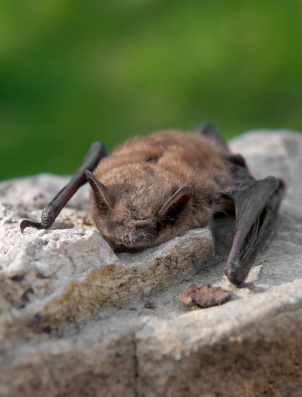 Pest management experts have reported, that a strong population of Little Brown bats, will provide effective pest control services to homeowners and farmers, by consuming tons of insect pests; each year. Unfortunately, recent studies released have offered evidence that the little brown bat population in the North Eastern United States, is experiencing a steady and hasty decline from exposure to White nose syndrome– a disease caused by exposure to a particular fungus; first discovered in 2006.